The optional foot controller allows you to route the guitar input to Channel 1 or 2, and to bypass the reverb, without having to access the amplifier's front panel. Two position footswitch for use with the Quilter Aviator Series. This footswitch works with the Open Twelve, Twin Ten, Ultralight Eight and the Deluxe Head. Quilter's in-depth knowledge of tone and overdrive is now available in a compact pedal format with 33/45 watts of speaker power. Perfect for the player who doesn't need the mighty Tone Block's 200-watt output. Go ahead, plug in, turn it up & watch the jaws drop as a big helping of high energy Quilter mojo pours out of this little box! Clean or dirty, this efficient little workhorse keeps on rocking. As a complete miniature guitar amp, the MicroBlock 45 can fill a bedroom, living room, or even a small club as a backup amp. In addition, the MicroBlock makes a great utility amp for driving headphones, and a great general purpose playback amp using either the guitar or minijack input. It can even be used as a natural distortion pedal by using the headphone jack as a line output. It's the easiest way to see what the "Quilter thing" is all about. Perhaps the ultimate sleeper, the Aviator Ultralight Eight might rank highest in the power versus portability ratio. Don't underestimate this little guy. It keeps up with most 40-60 watt 12" tube amps easily and has enough low end to leave you slack jawed in awe. The Aviator “ultralight” is a fully enclosed cabinet with an 8" high output full range driver. It is in a word a breath-taking tone and power that will keep on surprising you day after day, gig after gig. Quilter Labs has advanced the state of the art. It just may be time for you to take a test flight. The Quilter 12 inch Mach 2 combo is the ultimate amp when you need serious power in a small package. Featuring a powerful Neodymium speaker, (Celestion BN12-300s) it sports 300 watts of power handling and a searing clean responsiveness with no speaker breakup or cone cry. A sealed enclosure calibrated to deliver a very balanced and beautiful tone, combined with the powerful and up front characteristics of the speaker are perfect for the jazz player or anyone who loves an EVM-12L type speaker response. It comes with big big bottom end and crystalline highs. Great for electric and especially hollow body instruments, the 12 inch HD combo packs a serious punch for players who love the sound of a 12 inch speaker, and want something powerful enough to handle a full band but portable enough to go anywhere. Combine this with Quilter's 12 inch extension cabinet for staggering power that will easily handle outdoor gigs without a PA system. Weighing in at 21 pounds, it is easy to carry and small enough to go anywhere. 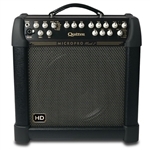 The Quilter Labs MicroPro Mach 2 HD 12" combo comes equipped with two channels, both of which offer 100 watts of power for a total of 200 watts when used together. It provides you with powerful tone-shaping tools for unmatched sonic versatility including a 3-band EQ, an onboard Boost with 5 unique Boost settings, a built-in Voice knob with 6 of the most popular and sought-after tones in guitar amplification, a Hi-Cut knob that allows you to roll off on the high frequencies, and an onboard limiter. The MicroPro Mach 2 HD 12" combo also features integrated footswitchable effects including Tremolo with Rate control and a shared Reverb for both channels with Tone and Dwell controls. The MicroPro Mach 2 HD 12" combo also features a unique Phase switch that reverses the amplifier's polarity which can reduce or increase guitar feedback as desired for particular playing styles. Channel 2 of the MicroPro Mach 2 HD 12" combo sports a 1/4" / XLR combo jack to provide you with incredible flexibility. You can use this as a clean guitar channel preset, or you can plug in a microphone. You can even plug in your mp3 player and jam along with your favorite backing tracks. Channel 2 comes equipped with an independent gain control (Gain 2) as well as an EQ control knob for sound shaping. Please note that the footswitch is required for multi-channel application. 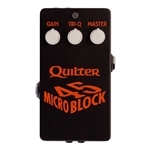 On the back of the Quilter Labs MicroPro Mach 2 HD, you will find an 8 ohm internal speaker output, a 4-8 ohm external speaker output, an Effects Loop, a Footswitch jack for use with a Quilter Labs foot switch, and an isolated Direct Output that allows you to connect to external powered loud speakers or a mixing console for recording or live performances. 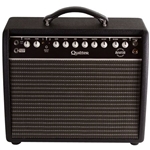 All Quilter Labs combo amps come complete with a durable ballistic nylon amp cover.